I want to apologize for my long absence. Not only have we been having some web server problems, but the shortened days have made it very difficult for me to take pictures, since my sub-par camera means I need the sunlight. Rest assured, I have been eating well, and on the occasion of my birthday, decided it was time to get back in gear. I made several dishes for a potluck Thanksgiving dinner I attended, including a pumpkin pie with assorted goodies. Having decided that coconut milk would be just right, I was going to improvise my own recipe when someone posted one from The Savvy Vegetarian that was just like what I had in mind, so I went ahead and used that one. Then I roasted the pumpkin seeds (sweetly this time) with the idea that they might make a good topping. 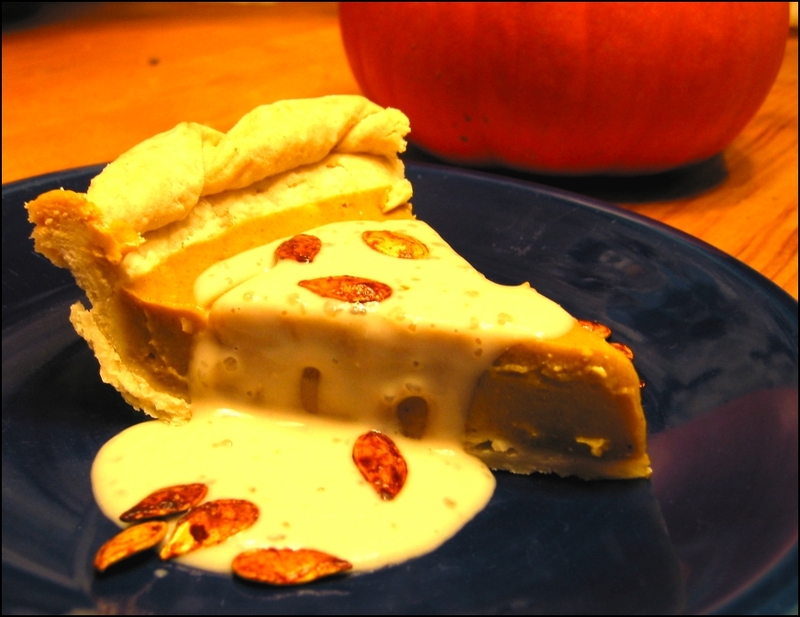 The next day, having chilled the pie sufficiently, I considered how nice a whipped topping would be, so I used the leftover tofu and coconut milk to attempt one, but while it would have likely been perfect out of a whip-it (and was quite delicious), it was too thin on its own. I thickened it a bit with some tapioca before deciding to just call it a sauce. It worked wonderfully on the pie as well as on the apple crisp I’d also made. Yay for experimentation! Click through for the many recipes. I figured I’d try making ciabatta (ie, Italian slipper bread, as it looks kinda like a man’s slipper) because it’s gotten so trendy in the past few years and there was a recipe in my bread book. 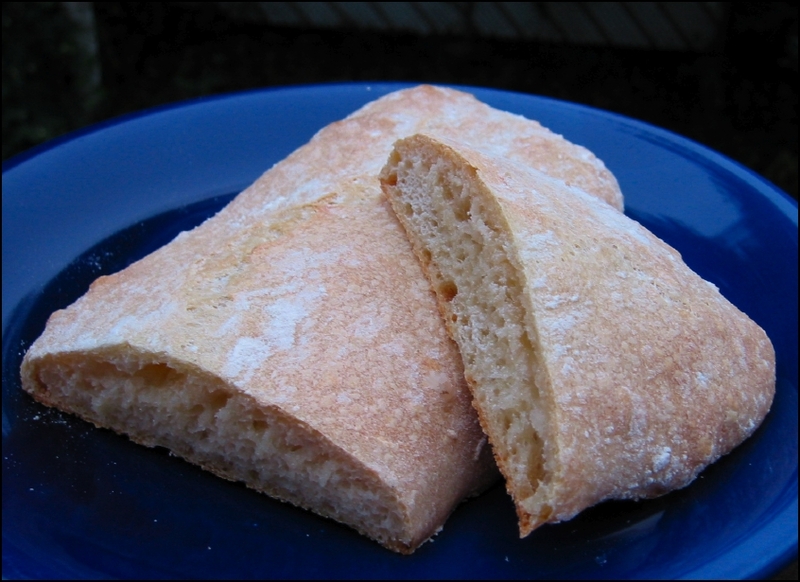 The ciabatta process is quite different from other breads. It requires a starter begun the night before and the dough is so wet, it is never actually kneaded. It remains wet and gooey until baking, in fact, but once out of the oven, this was one of the best breads I’ve ever eaten. My roommate and I would have finished both loaves within hours of baking if I hadn’t put my foot down to insist we save some for later. The important points to keep in mind when making this bread are avoid adding extra flour to the dough and handle it with a very light touch after rising. Extra flour is very tempting because the dough is so hard to work with, but really, don’t do it except for when you need it to shape the loaves. After rising, do not punch down and be very gentle while shaping. Also, you really can’t use too much flour for the shaping process. If you have silicone baking mats (sadly, I do not), this would be a very good time to use them. I love pickles and I always have. As a Jew and a native New Yorker, it is in both my nature and nurture so shouldn’t surprise anyone. Perhaps more surprising in that I’ve rarely actually made them and thus far never made my favorites, but we start simple and work our way up. These two varieties of refrigerator pickles are very easy and quite yummy. I made the Swedish-style sweet slices for the first time last year when I was getting many many cucumbers in my farm share and couldn’t come up with ways to use them up fast enough. I used the food processor’s slicing disk to make ultra-thin slices and the results were fantastic (and never lost their crunch!) For the sours, I wanted something heftier, so I sliced them thickly by hand. I had far fewer cucumbers this year (sadness), so it didn’t take too long. I used plain distilled vinegar, so the sours are quite sharp, whereas the sweet were in white wine vinegar. You could certainly use a nicer vinegar for the sours. 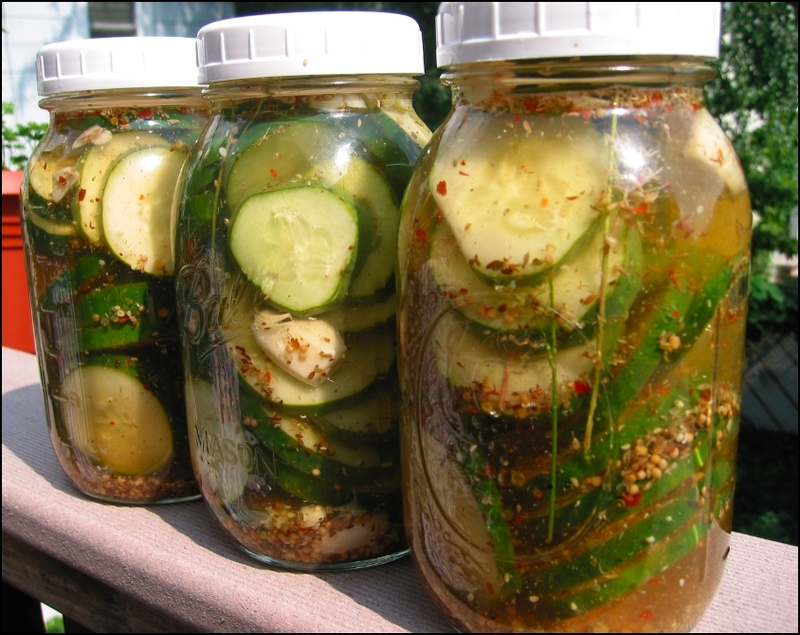 I wanted to can pickles this year and I’d tried to grow pickling cukes in my garden, but they didn’t really flourish. I ended up with many small ones, useful (& yummy) for one or two salads apiece, but not really appropriate for pickling, and I neglected to buy a bushel from a local farm. Ah well. Still, these were all nummy and quite popular at potlucks. Both of these can be scaled as far up as you want to go and keep quite well, assuming you can keep them from getting et.